Few things can stall or even kill a home sale faster than the discovery of a potential underground heating oil tank during inspection. If you’re about to enter the real estate market either as a seller or a buyer, underground heating oil tanks are definitely something you should know about. Luckily, Eugene has a resident expert. Meet Madeline Carlton, owner of M Carlton Construction and a DEQ-licensed Heating Oil Tank Supervisor. We recently had the pleasure of speaking with her, and she was kind enough to walk us through the ins and outs of her craft and the path that got her to where she is today. When it comes to underground heating oil tanks, Madeline likes to emphasize: “This is my wheelhouse now.” Since entering the field several years ago, she’s dedicated herself to “knowing everything there is to know” about underground tank regulations and decommissioning. But Madeline also has a wealth of not-entirely unrelated experience under her belt. She got her start in the real estate industry remodeling fixer-uppers then selling them for a profit. This work gave her a real insider’s perspective of what it takes to market a home for maximum return on investment. Wanting to be her own boss, she decided to turn this knowledge into a career, obtaining certification from The Home Staging Resource. With her staging business underway, Madeline quickly saw an opportunity to use her keen eye and experience flipping homes to help her clients in a larger way. So she obtained a contractor’s license and began to perform renovations on their homes herself. Another opportunity, though, was soon brewing on the horizon. Madeline’s husband had spent some time working with Robert DeSpain, one of the region’s most respected authorities on underground heating oil tank decommissioning. When DeSpain retired in 2016, the company he worked for didn’t have a replacement lined up. This left a huge hole in the Eugene area. Underground heating oil tanks were relatively common in homes built around 1940-1965, and DEQ-licensed supervisors are in short supply. As of now, there are only 48 in the state of Oregon. Madeline saw an opening. In addition to her flexible attitude and eye for opportunity, Madeline had another ace up her sleeve: DeSpain was happy to take her on as his apprentice. Throughout the first year of her work decommissioning oil tanks, he accompanied her to every jobsite until she was fully ready to set off on her own. Since then, M Carlton Construction has branched out into excavation and other “heavy-duty exterior” work. Her husband, Jonathan Carlton assists as project manager and estimator. Brandon Weaver adds considerable skill and experience as an equipment operator and project manager. 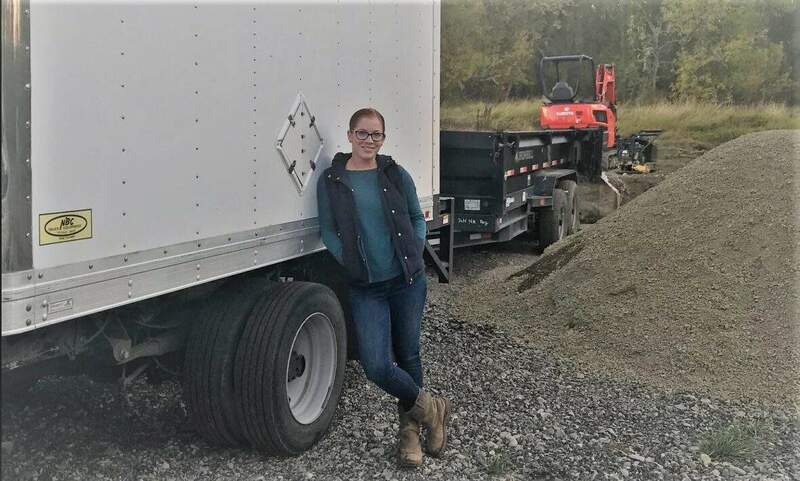 In addition to the heavy-duty exterior work and a considerable amount of DEQ-related paperwork, Madeline sees cultivating awareness as a huge part of her job. Oil, she points out, is a great source of heat. But putting tanks underground is simply a bad idea, especially in the Willamette Valley with its moist soil. Around here, their useful lifespan is around 25 years, and regular maintenance is essential. Underground, though, usually means out-of-sight and out-of-mind, and this can have disastrous consequences for homeowners. Underground tanks were most popular in the 50s and early 60s, though Madeline has found some dating from the 1940s. If you own a home of that vintage, it’s worth finding out whether there’s a corroded, leaking tank lurking in the shadows and contaminating your soil. The best-case scenario is that the tank was left empty. More oil means more contamination. It should go without saying: if you’re still using an underground tank, stop! It’s likely that the oil is seeping straight out the bottom and creating a bigger and bigger mess. In Madeline’s view, the main issue is a lack of awareness. In 2000, the DEQ passed regulations requiring the decommissioning of underground heating oil tanks. But homeowners, and in some cases their agents, may not be aware of the potential presence of an underground tank. It’s often only later, in the midst of the closing process, that the issue comes out from the shadows. “Generally, homeowners aren’t being proactive or just don’t know that they have a tank,” Madeline explains. Rather, they’re coming to her after potential signs of an underground tank show up on a would-be buyer’s inspection report. She’s received any number of frantic calls from agents trying take care of the issue before close. The unfortunate reality, though, is that even a simple, low-contamination decommissioning will likely take a month. With so few licensed Heating Oil Tank Supervisors around, they tend to have a decent-sized stack of reports on their desks. It also takes a chunk of time to send off soil samples and get them back from the lab. So especially if soil contamination is extensive then, as Madeline puts it, “Your closing date is toast.” Her most extensive clean-up operation to date took a staggering 7 months from start to finish. If your buyer is completely in love with your home, they may be willing to wait. Then again, maybe they won’t, especially in Eugene’s fast-paced market. But if signs of an underground heating oil tank do show up on your inspection report, there’s no need, necessarily, to panic. Home inspectors are required to point out the potential presence of an underground tank, but there are various possibilities. That copper supply line sticking out from your foundation could have been connected to a since-removed above-ground tank. If you’re finding a random pipe sticking out of the ground, it could be something completely unrelated to an oil tank. Or it could have once led to a since-decommissioned underground tank. But even in a best-case scenario, nobody likes it when alarm bells start ringing in the middle of a transaction. It’s an open secret that buyers have a lot of leeway to cancel a transaction on account of inspection contingencies. So it’s better to do your homework before you put your home on the market. Madeline suggests that, at the very least, homeowners and their realtors do a visual inspection of any home built during the underground tank heyday. The fill spout and vent pipe are the two above-ground components of an underground heating oil system. Both are most often located next to the building’s foundation, but you might also find them on either side of your driveway or anywhere easily accessible by an oil truck. Madeline does occasionally find them in back yards. You’re more likely to find the vent pipe than the fill spout: it’s a metal pipe about 2 inches in diameter, normally with a small cap. If you see something that fits that description, call a professional. It could be nothing, or it could be the tip of a much bigger and oilier iceberg. Madeline is happy to perform a search herself and either set her clients’ minds at ease or confirm the need for action. Initially, she referred locate requests to her mentor, Robert DeSpain, who continued to perform them in his retirement. But when he suddenly passed away in 2018, there was once again a huge gap that needed to be filled. So, having inherited her mentor’s old magnetic locator, she decided to start performing the searches herself. “It’s like having a little piece of him with me,” she says. Finally, What Does your Realtor Need to Know? We’re obviously not experts on underground heating oil tanks on the same caliber as Madeline. But we have made sure to do our homework. In our work in Bend and Eugene, we’ve encountered our fair share of underground tanks, both as false alarms and as unfortunate realities. First of all, don’t let your Realtor tell you that you can just sweep the issue under the carpet (or underground, we should say). On the same token, don’t let them tell you not to worry unless it comes up on the buyer’s inspection report. If you’re concerned that you might have an underground tank, then your agent should be concerned as well. Even if what you’re seeing looks like a bargain to you and your Realtor, don’t commit until you have a clearer picture of the damage. Clean-up costs and time-frames can vary wildly, and you could wind up stuck with a nightmare. Madeline’s own experience is that agents who do business in parts of town where underground tanks are common tend to have more knowledge and awareness. These areas include downtown, the University district, off Highway 99, and South Eugene. Conversely, underground heating oil tanks are quite rare in Springfield. But that doesn’t mean you shouldn’t keep your eye out for them. In conclusion, whether you’re seeking to be proactive or in the middle of a transaction that’s threatening to go off the rails because of a potential underground tank, Madeline and M Carlton Construction are there to help. Visit them online at mcarltonconstruction.com for all of your underground heating oil tank and excavation needs. And you can rest assured that if you work with us, we’ve got your back too. Transactions can fall apart for many reasons–we’ve seen them all, and we’ve managed to fight our way tooth and nail through many of them to advocate for our clients. You can look at Eugene homes for sale or Bend homes for sale from the comfort of our website. Better yet, contact our Eugene office or Bend office and we’ll get to work on helping you buy or sell a home right away.